Did you know that mosquitos can lay eggs in just about any source of standing water? Even an over-turned bottle cap that has collected water can be the perfect place for 300 hundred eggs! After those eggs are placed, it only takes 7 – 10 days for those mosquitos to fully develop and begin looking for their next blood meal. Asian Tiger Mosquitos, which are the most common in the Baltimore-Metropolitan area, have a flight range of 300 ft. Other mosquito species can range up to 1 – 3 miles! Asian Tiger Mosquitos (Aedes Albopictus) are an exotic species introduced through Asia. They have become a major public health risk in the Baltimore-Metropolitan area. Female mosquitos are the only mosquitos that bite. They require a blood meal as a source of protein to assist with egg production. They use carbon dioxide exhaled by mammals to locate a host. Male mosquitos do not bite or require a blood meal. Like many other insects, male mosquitos feed on nectar and other plant juices. Female mosquitos only need to mate one time. After that, the mosquitos can lay an average of 100 eggs every third night. Female mosquitos commonly lay three sets of eggs during their lifetime. 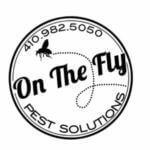 For more information on mosquitos and treatment in the Baltimore-Metropolitan area, contact On The Fly Pest Solutions. On The Fly provides free estimates as well as information about prevention and treatment plans that best match your needs.